It seems like I can't go a week without playing a new rhythm game on my Switch. Musynx, Lumines, and now Lanota. Like many of the others (including two that Lanota's publisher previously brought to Switch - Deemo and Voez), Lanota is originally a mobile game. 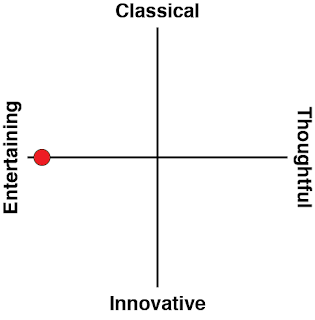 And, like all of the others, it's a delight to play. It also has the most original gameplay foundations of all the rhythm games that I've played. I don't usually come to rhythm games for the gameplay, as such; it's the ability to immerse myself in music that makes the best examples of them so appealing. In other words I rarely take notice of how these games play, but Lanota certainly insists that you pay attention to it. Most rhythm games feature "notes" that scroll across a screen to a set point (usually at the base of the screen) which represents the timing that you're meant to hit the "key" in time with the music. Lanota's a little different. 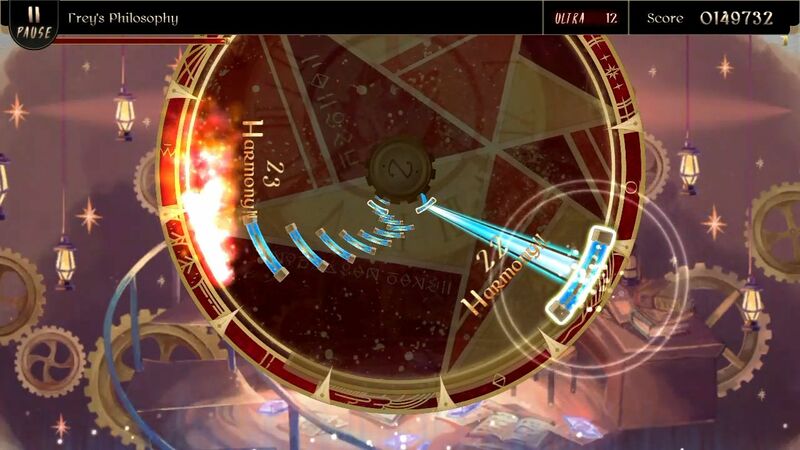 In Lanota, there's a ring that moves around the screen, and the notes roll their way from the centre point of the circle to the edge of the ring from a full 360-degrees direction. The ring rotates, scrolls, grows and shrinks to suit the music track, and so too do the notes that you'll be tapping along with. This has two effects. 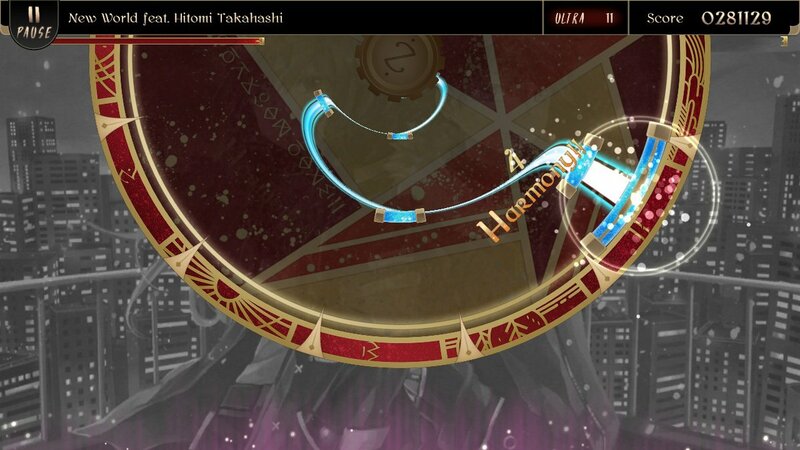 Firstly, it introduces a new way to play for people who have played a lot of rhythm games. That circular motion and movement of Lanota's ring made sure that I needed to focus on what I was doing, and as much as I love rhythm games, it's nice to play a new one for reasons beyond having a different track list. It's also nice to see developers experimenting with different ways to represent rhythm and the movement within music visually, and the creativity and passion that drove this game is boundless. 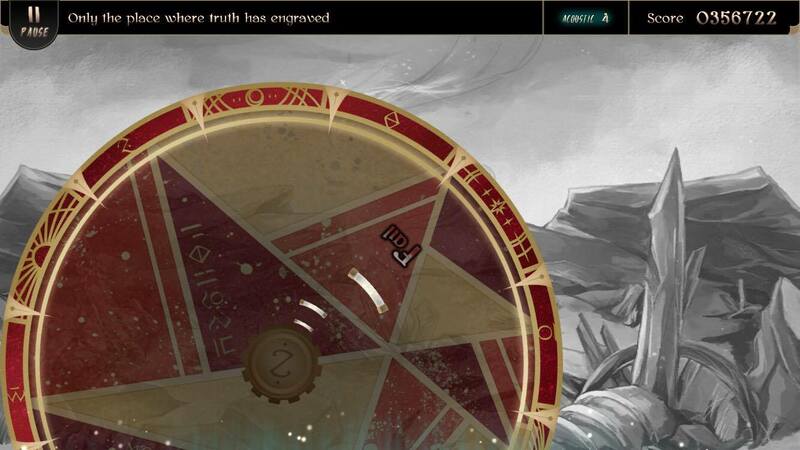 Secondly, because it's difference, Lanota is challenging without requiring ridiculous feats of dexterity. So many rhythm games only have one recourse to up the difficulty from one level to the next, which is by making an increasingly crazy number of notes appear on screen at a ridiculous rate. Even my precious Hatsune Miku games approach their difficulty that way. Lanota has an element of that, of course, but on the higher difficulty settings, more challenge comes from the game getting creative about the way it uses that ring, and the feel of play becomes less about frantic memorisation, and more focused on being precise with the lyrical movement of the music. 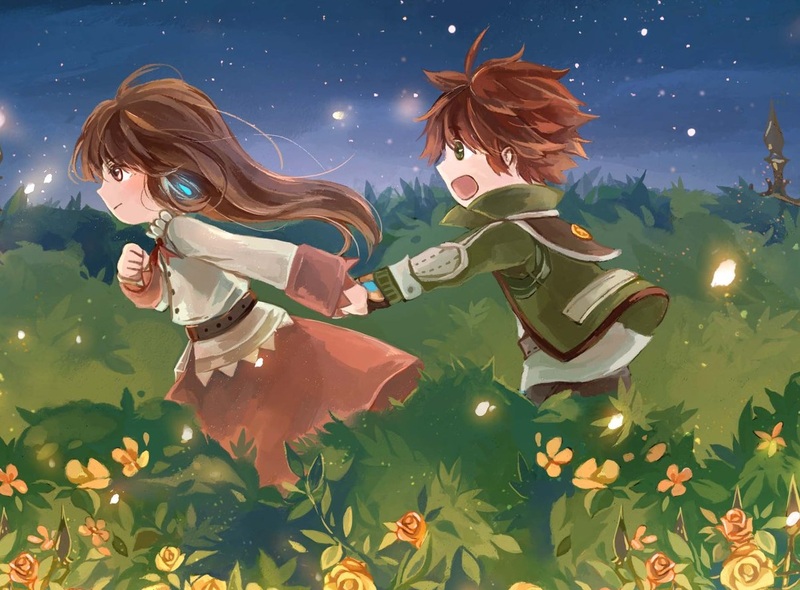 In that, the gameplay actually matches the storybook approach and story that Lanota is telling perfectly. That's right, Lanota has a story. And while it won't be winning any awards as a masterpiece of the genre, it's a beautiful little take on the classic children's storybook. If nothing else, it's nice to have a rhythm game that does genuinely try to stretch beyond a core rhythm action. When I first started to play I was a little concerned that the game would actually force you to read through a section of narrative every time that you wanted to play a music track, as the tutorial doesn't give you a music selection menu. That would have gone too far because ultimately when you are playing a rhythm game you do want to spend most of your time within the music. However after a couple of "intro" tracks, the full music selection opens up, and then you can read through the story sequences at your own pace as you unlock them. It's spot on in execution. Where I feel Lanota goes wrong to an extent is in some of the music choices. Because the developers committed to a narrative, and because the team worked so hard at building a distinct set of aesthetics to match that narrative, Lanota also feels like the music should reinforce that specific theme. It looks and feels folksy and twee, which is delightful, and certainly that kind of music can be beautiful and evocative. 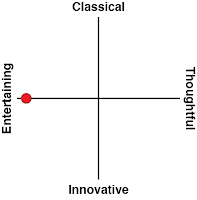 Just as I became enamoured to Deemo for its love of aesthetics of nature blended with classical piano, I went in expecting that Lanota would offer something pastoral and airy; something pleasant and gentle on the ears to go with what it offers the eyes. So why the electronic and heavy beats in so many music tracks? Deemo held its theme together in making sure that even in the rockier music, the influence of the piano remained prominent and in the fore. Lanota's lacks that consistency, and the impression that's left is that the developers pulled whatever music they could find together - as though they were building a thematically flat rhythm game like DJ Max - and then tried to shove it into a very specific narrative and visual theme that they had developed. I can appreciate that as an independent development team and probably lacked the resources to be too choosy about the music - especially since rhythm games are expected to reach for a quantity of music to be competitive - but the lack of consistency does hurt the game somewhat. That's not to say there's something inherently wrong with the music of Lanota. I would say that I'm struggling to find really memorable favourites as I have with the other rhythm games on the Switch, but then I wonder if that's just because I don't always draw the link between the music and the aesthetics. If some of those tracks were in in a rhythm game that was more a pure-play rhythm experience, such as Musynx, and if the disconnect wasn't so distracting, I suspect I'd find many of them more memorable. Lanota has the distinction of being the most interesting rhythm experience on the Nintendo Switch by virtue of that unique and clever gameplay mechanic. It lets itself down a little compared to the many other rhythm games on the console by having too much music at odds with the theme and aesthetics that are carried through the presentation, and that inconsistency is disappointing. It's still delightful, but perhaps a game that would have been better off in the hands of developers with a greater capacity for music curation.